No beer of the week? No problem. While I work on some new bum wine concoctions to make sure I have something tasty on tap for all of you to enjoy this coming Fourth of July weekend, I figured it was time to take a ride in the wayback bum wine machine for a classic feature! What is buried in my shelf full of VHS tapes? Let's find out! The year is 1990 and there is an Inspector Gadget Super Spy Saturday marathon on Nickelodeon. 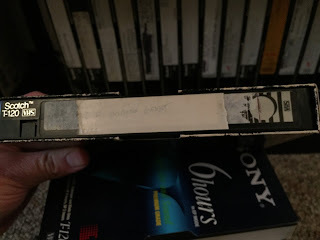 What better way to spend your weekend than by watching some classic commercials that aired during this special recorded on a 26 year old VHS tape? Well, I believe it was actually in 2003 when I transferred these commercials off of the VHS to the computer and burned them to a blank CD-R, but it was only earlier this year that I finally uploaded them to YouTube for all to enjoy! Sit back, relax, grab your favorite adult beverage of choice, and enjoy some classic commercials! Will this become a regular feature at bumwinebob.com? You never know! Remember to tune in LIVE tomorrow night at 11pm ET to the bumcast! Cheers!